THE SKINNY: My skin is sensitive and quite persnickety at times, so I was thrilled to find a body wash that smells great and does wonders for my skin. 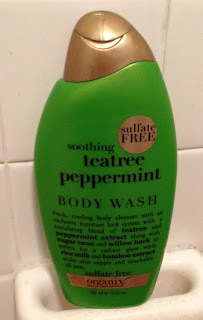 The body wash left my skin very clean -- and smelled great without being overpowering -- and helped keep it from drying out too much. The body wash is also sulfate free, which is good for me and the environment. And I keep hearing that Tea Tree Oil helps keep the mosquitoes at bay (a huge bonus in this area right now). At less than $7 for a good-sized bottle, this product is a deal! CHECK IT OUT: Learn more about the Organix line or shop at retailers such as Ulta.